Shopping for an off-road or a commuter bike is not easy – especially if you want to cover a variety of terrains. The Diamondback Trace Dual Sports has been designed just for that. With its innovative mountain bike like geometry and comparatively larger wheels (700C), the Diamondback Trace Dual Sports is ready to scale any terrain with utmost grace and ease. 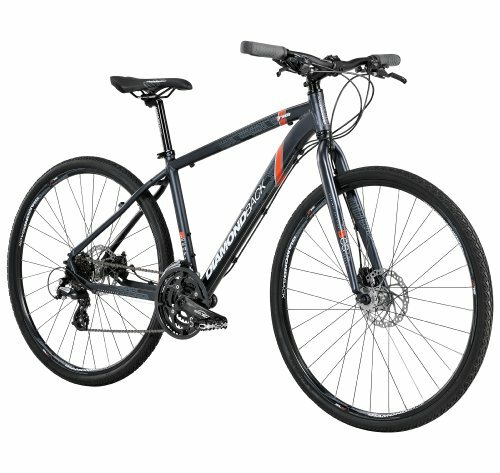 This is the entry level model in the Diamondback Trace series. All the Diamondback Traces come with 6061- T6 Butted Aluminium Dual Sports Frame with formed top and down tubes, an integrated chainstay disc brake mount and forged drop outs. The Dual Sport Fork helps to absorb any unexpected hits or bumps from the road and allows for a smoother ride with superior control. The wheels are one of the most important parts for any dual sports vehicle and the Trace is no exception. For handling the gravel, it has been equipped with 32h Weinmann SL-7 Double wall rims with SL-7 Alloy hubs and Innova Dual Sports 700x40C tires. It comes with a Trace 6061- T6 Butted Aluminium Dual Sports Frame with Formed Top and Down Tubes; SR Suntour NVX-MLO Fork; Shimano Acera FCM361 Cranks with Chain Guard (28/38/48t); Sealed Cartridge Bottom Bracket; Shimano Acera Dual Pull Front Deraulleur; Shimano Alivio 9 speed Rear Derailleur; Shimano SL-M360 Shifters; Avid FR5 Brake Levers; Avid BB5 Disk Brake Set (with 6 Inch Rotors); Shimano HG-20 ( 9 speed) Cassette; 32h Diamondback SL-7 Rims; Innova Dual Sports Tires with Puncture Resistant Casing; Wellgo Forged Alloy Pedals; DB Lazer Series Handlebar (31.8 millimetre); DB AL-6061 A-head Stem (7 degree, 31.8 millimetre); DB Lazer Series Seatpost (27.2 millimetre) with Micro Adjust; DB Dual Sports Series Seat (Black); A-head 1-1/8 inch Headset; KMC Z-99 Chain; 14g Stainless Steel Spokes and Diamonback Dual Density Comfort Grips. 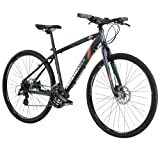 The Diamondback Trace Dual Sport is the entry level bike in the Diamondback Trace series. The bike has been designed to handle all kinds of terrains and can be used for off-road biking as well. If you have been searching for a bicycle that can serve as an alternative commuter, you can consider this one as one of your options. On the other hand, if you are a rookie looking to get into biking, this one is a great choice.